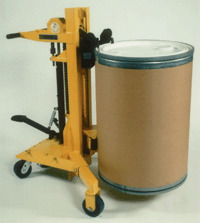 A safe and effective family of portable drum handling products that can be used by any of your operators. 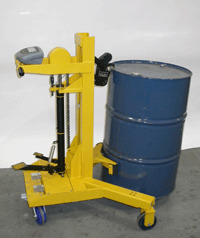 The Ergo-Matic line of drum handling devises are capable of lifting, lowering and transporting any steel plastic or fiber drum up to 1000 pounds to a height of 38" off the floor. Spring loaded Parrot Beak clamp holds any rimmed steel, poly or fiber drum. Compact footprint and swivel casters provide easy maneuvering in tight areas, while floor lock keeps unit in place when lifting and lowering. Standard lift height 20". Protective nylon belt cradle is standard on all units. 5" Casters. Model LOM-ERGO1000-DH - Double Beak Model - Good for fiber drums. Note: Special units are available. 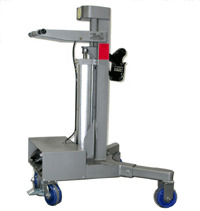 Example: Air power lift - Scale - Please call ZORIN (888) 378-6525 to discuss you specific needs. Thanks.